Legend is a medieval hack-and-slash game that seems like it should be a lot of fun (think Golden Axe or Knights of the Round.) I consider myself to be a huge fan of the genre, so I was excited to play this game. The game’s crisp graphics and large, detailed sprites leave a good first impression, but unfortunately the game fails miserably in the game play department. Both moving and attacking are painfully slow, and the problem is exacerbated by the high volume of enemies. The AI in the game is such that the bad guys will quickly outflank you so that you can never stay in one place for any length of time. 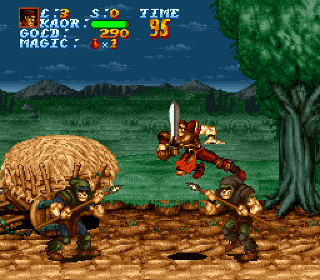 As there are always multiple enemies on the screen, the only way to stay alive and keep killing the baddies is to repeatedly jump in the air and attack on the way down, then repeat the process about 50 times per wave of opponents. This gets old and boring very fast. If this game were properly balanced, it would have either less enemies or a larger variety of moves that could be employed to dispatch a large number of foes. You can use magic spells after accumulating a few magic potions (exactly like Golden Axe), but you can’t use them often enough to offset the problems with physical attacks. It’s a shame, because the detailed graphics coupled with the immersive and varied environments provide a great backdrop for what could have been an awesome game. My love for the genre probably gave me a lot more patience for this game than most gamers would be able to muster. Unless you really love beat-em-ups, and are really desperate for a new game, this one should be avoided. Buy Legend on GameGavel or Amazon. Tagged Arcade, Arcade Zone, Beat 'em Up, Fantasy, Legend, Nintendo, Review, Seika, SNES, Super Nintendo. Bookmark the permalink.